TB Joshua has an explanation for everything, even if his gifts of prophecy are not quite as acute as he would like us to believe. 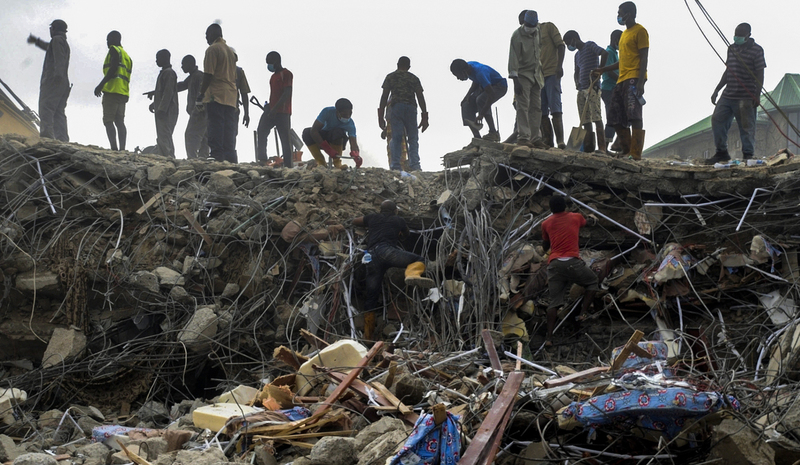 The collapse of his church guesthouse in Lagos is no exception. But conspiracy theories can’t mask the obvious truth: the self-styled prophet’s empire is built on wobbly foundations. And his is not the only one. By SIMON ALLISON. You would think TB Joshua, Africa’s most famous and commercially successful pastor, would know exactly what caused the collapse of the guesthouse belonging to his church in which at least 80 people died – including 67 South Africans. He is a self-styled prophet, after all, apparently possessed of divine powers of prediction, although even he is powerless to alter the fates he claims to foresee. Nonetheless, the good pastor waited several days before revealing his thoughts on what caused the unnatural disaster. “I do not want to put fear in the minds of Nigerians. We are still battling with the Ebola virus disease, and that was why I have decided to delay my comment till now,” he said. Classic TB Joshua, always putting the greater good first. A cynic might assume the delay was actually about buying himself enough time to concoct a plausible explanation that absolves himself of blame, but we know that’s not true – for the explanation he eventually proffers is far from plausible. This is what happened, according to Joshua: minutes before the six-storey building eventually collapsed, a mysterious plane circled four times around it in unusually close proximity. The pressure and the vibrations generated by the plane somehow triggered the building to crumble; perhaps, he suggests, because some kind of corrosive chemical substance was sprayed on it at the same time. As for who might be responsible, well Joshua has a theory on that front too, telling his congregation on Sunday that Islamist militant group Boko Haram were the likely perpetrators. “They are trying to scare you from coming to church. Don’t be scared, you are not the target, I’m the target. I know my time has not yet come. I have not yet finished my job,” he said. It is a fanciful story. Unidentified aircraft buzzing around busy Lagos airspace? Chemicals falling from the sky? As for Boko Haram, well they’re rather busy at the moment, occupying vast swathes of territory in north-eastern Nigeria. And they wouldn’t need to come up with such an elaborate plot: the group has repeatedly demonstrated in the past that they can destroy targets seemingly at will, using more conventional methods such as car bombs. So what, then, was the real problem? I’m no multimillionaire televangelist, so forgive me for preaching, but perhaps TB Joshua should consult his Bible again. The story of the foolish man who builds his house on the sand comes to mind. This is what happened next: “And the rain fell, and the floods came, and the winds blew and beat against that house, and it fell, and great was the fall of it.” (Matthew 7:27). TB Joshua and his Synagogue Church of All Nations may not have built their guesthouse upon the sand. But, as initial reports indicate and as Nigeria’s long history of building collapses suggest, they almost certainly built their guesthouse on poor quality foundations with cheap materials and dodgy construction practices. And great was the fall of it indeed. There are lessons in this for TB Joshua, whose precipitous rise from farmhand to fame and fortune is itself based on the shakiest of foundations. He’s a charismatic preacher, sure, but it’s hard to believe sthere’s any real substance behind his claims to heal injury and disease – is it holy water he’s selling, or snake oil? Miracles or cheap magic tricks? Either way, his failure to protect his congregation – and, even more damning, his failure to predict this tragedy in advance – will surely damage his reputation. There are implications too for the Nigerian state, and not just because of the close relationship between Joshua and President Goodluck Jonathan (first lady Patience Jonathan is a particular fan). Although that certainly does present an already weakened Jonathan with yet another headache. One of his core constituencies is the evangelical Christian community, and the president will need to find a way to punish those responsible for the building collapse without attacking the still enormously popular TB Joshua himself. On a grander scale, however, it’s hard not to view this incident as a metaphor for the precipitous, vertigo-inducing rise of Nigeria itself. Just five months ago, Nigeria became Africa’s largest economy when its GDP figures suddenly increased by hundreds of millions of dollars, leapfrogging ahead of South Africa. The country has become an investment darling, with its enormous population ripe for an explosion in consumption, and is starting to demand recognition as a – or perhaps the – continental superpower. But Nigeria itself is based on wobbly foundations. That economic growth is something of a mirage, based on non-sustainable resource exploitation and some long over-due fiddling with the way in which GDP statistics are calculated. Good governance, key to any successful nation, is still sorely lacking – the inability to impose a regulatory framework on the cowboy construction and cement industries being a prime example of an endemic failure of the rule of law. And that’s before we even get on to the country’s legendary corruption, notoriously poor infrastructure or even that civil war it’s fighting (and losing, by some accounts) in the north-east of the country.